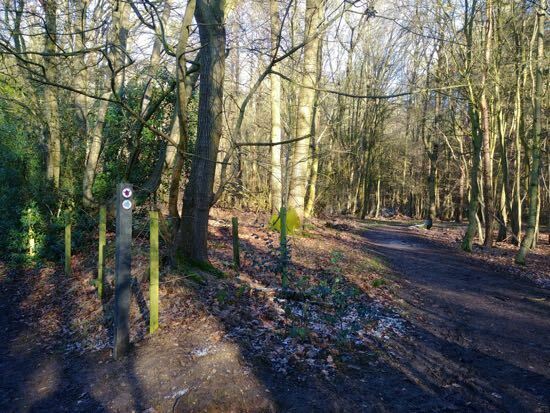 A 13-mile linear station-to-station route starting at either Brookmans Park or Welham Green stations and ending at Welwyn Garden City taking in part of the Alban Way and wandering through Symondshyde Great Wood. 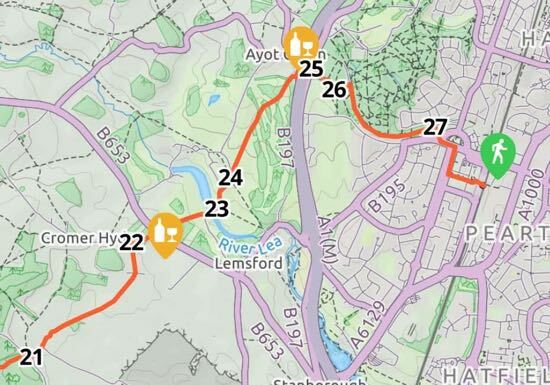 There are a number of pubs either on the route or just off. Parts can be muddy after rain. 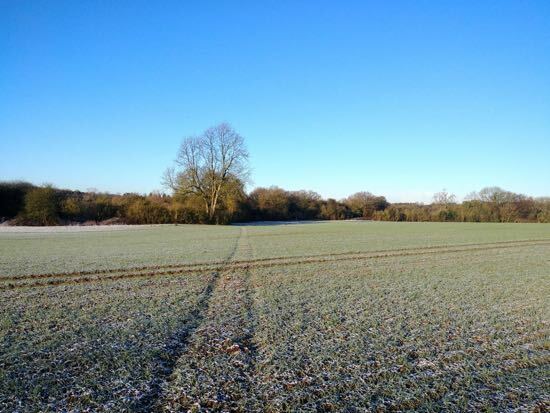 There are a few noisy stretches close to the A1(M), and you have to cross a few busy roads, but it's almost all on secluded paths with some stretches on quiet country lanes. We have broken the map for this walk into three sections because it's too long to include in one image and retain enough detail. 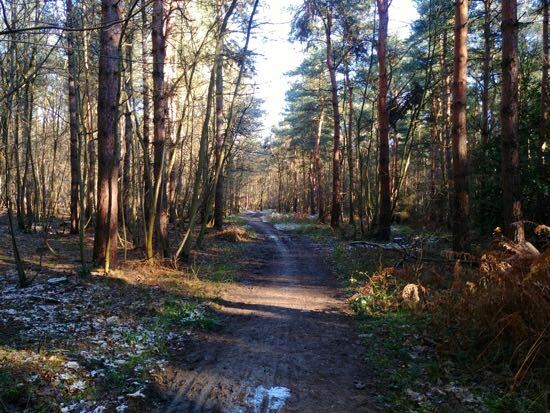 This walk can be done in reverse walking from Welwyn Garden City Station and catching the train back from Brookmans Park or Welham Green. 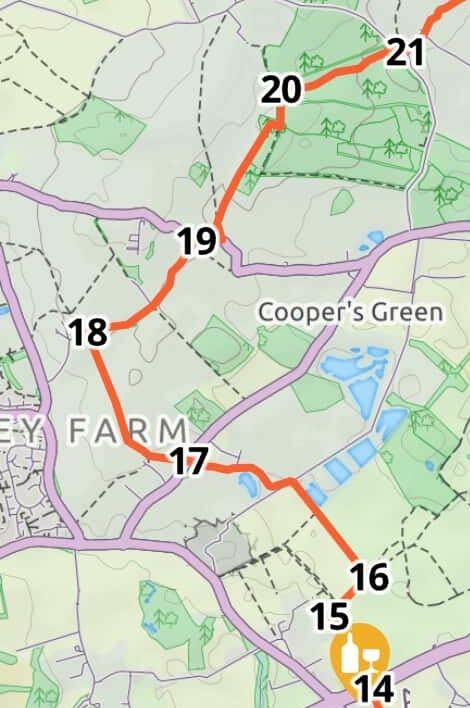 If you want to do this walk from Welham Green station you can do so by joining the route set out between points 3 and 4 in the map above. To reach this point leave Welham Green station and head south-east along Dixons Hill Road. Turn left on Holloways Lane. Turn right on Bulls Lane. Turn left on Station Road and head south looking out for a footpath on your right (North Mymms footpath 8). Continue along this path heading south-west until you join the route below between points 3 and 4 described below. 1: Leave Brookmans Park station and head north along Station Road until you reach Bradmore Lane on the left. Here you turn left and head west along Bradmore Lane until you reach the first bend where you will see a footpath sign on your right. 2: Take this footpath (North Mymms footpath 7) and head west along a path that has been cut through the crops. You are heading in the direction to the right of the largest tree on the opposite side of the field. 3: When you reach the hedgerow turn slightly to your right and head north-west keeping the hedgerow on your left and field on your right. Ignore the first two white marker post but turn left at the third. 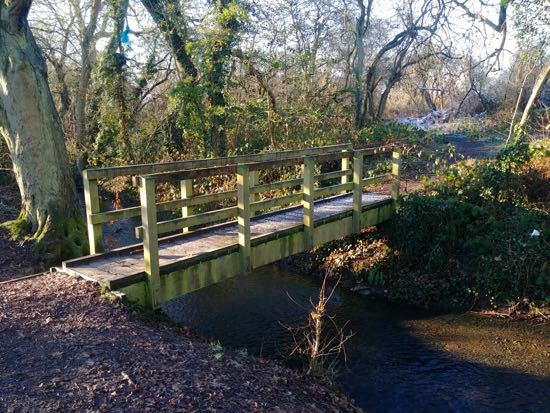 Here you follow the footpath (North Mymms footpath 30) as it drops down to cross a small stream via a footbridge and then climbs up to an open field. When you reach the field turn left and, keeping the hedgerow on your left and the field on your right, continue heading west until you reach Swanland Road where you turn left and follow the footpath until you reach the junction with Warrengate Road. 4: Cross Swanland Road heading for the bridleway (North Mymms bridleway 82) which crosses the A1(M). After crossing the motorway look out for a footpath sign on your left (North Mymms footpath 6) which crosses the field heading north-west until it reaches St Mary's Church Road. 5: Turn right and walk north-east down St Mary's Church Road, cross the bridge and continue to Tollgate Road. Cross the road and turn left walking a short distance on the east side of Tollgate Road until you reach a footpath sign on your right. 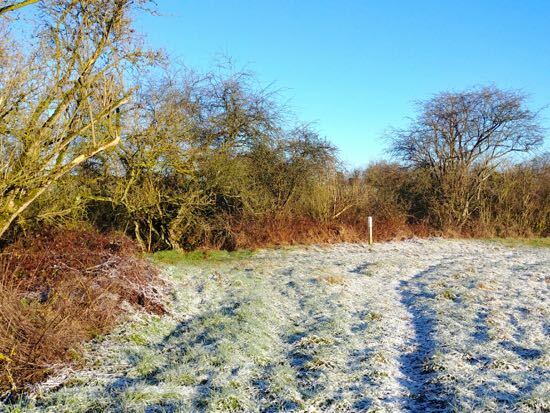 6: Take this path (North Mymms footpath 52) and walk north through a small area of woodland emerging in an open field. Here you will find the farmer has cut a path through the crops heading north-east towards the A1(M). Take this path until you reach the motorway and continue along the west side of the motorway until you reach some wooden steps. Climb up the steps and then go down the other side continuing along the footpath (North Mymms footpath 55) along the west side of the A1(M) until you reach a footpath (North Mymms footpath 28) cut through the crops on your left (just before you reach the large blue motorway sign on your right). 7: Take this footpath and head south-west along a path cut through the crop. Cross the farm track and continue along this footpath heading for the pylon in the distance. Immediately after the pylon turn right on another footpath (North Mymms footpath 41) and follow it north-west until you reach the gate out to Tollgate Road. Turn right and then walk down Bullen's Green Road on your right. 8: Head north along Bullen's Green Road, across Fellowes Lane and continue until you reach a footpath on your left just before the houses on the left. 9: Take this footpath (North Mymms footpath 67) heading south-west until you reach a footpath T-junction. Here you turn right (there will be a play area and park on the left) and follow the footpath (Colney Heath footpath 23) north-west until you reach Roestock Lane. 10: Cross Roestock Lane and continue north-west along the byway (Colney Heath Restricted Byway 51) and follow it as it veers right past a pond and continues heading north. Follow this byway north and north-west until you reach the busy North Orbital Road (A414). 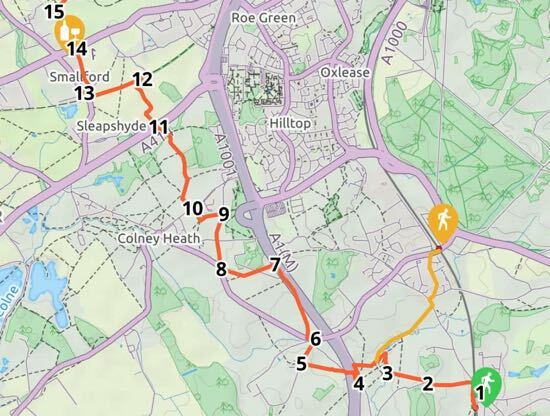 11: Cross the A414 and continue heading north along the byway open to all traffic (Colney Heath BOAT 51) until you reach the Alban Way (the old railway track between Hatfield and St Albans which is now a public bridleway). 12: Turn left on Alban Way and head south-west until you reach the bridge carrying Smallford Road over the disused railway. Here you turn right just before the bridge and follow the path north to the junction of Station Road and Wilkins Green Lane. 13: Turn right on Wilkins Green Lane and head north-east a short distance looking out for a footpath on your left (Colney Heath footpath 12). Follow this path north until you reach Hatfield Road (A1057). At this point you could turn left for refreshments at either The Three Horseshoes or Notcutts Nursery. 14: Cross Hatfield Road and continue heading north-west along the footpath (Colney Heath footpath 15). 15: The footpath turns north-east. 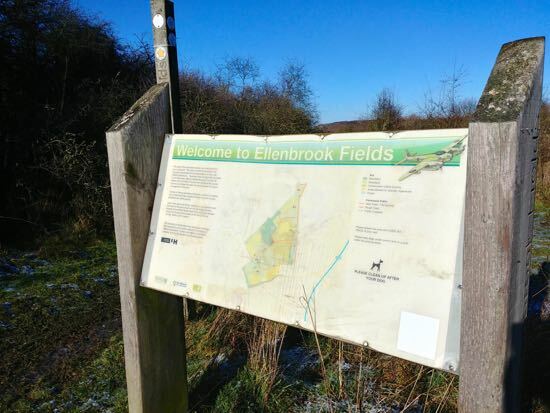 Ignore the footpath on your left and continue for a short distance to reach Ellenbrook Fields. 16: Turn left at the sign and follow the footpath (Colney Heath footpath 14) heading north-west again past a barrier and on to a track and a conveyor belt carrying gravel. Cross the conveyor belt and follow the footpath (Sandridge footpath 52) as it weaves north-west to Coopers Green Lane. When your footpath turns left (just before Coopers Green Lane), ignore that junction and continue along the track to its junction with Coopers Green Lane. 17: Cross Coopers Green Lane and take the bridleway (Sandridge bridleway 10) on the other side of the road as it heads north-west. Follow this path north-west through the fields until it reaches Nash's Farm Lane. 18: Turn right on Nash's Farm Lane and head north-east along this quiet lane until you reach Woodcock Hill. 19: Turn right on Woodcock Hill and head east a short distance until you reach two right-of-way signs on your left. 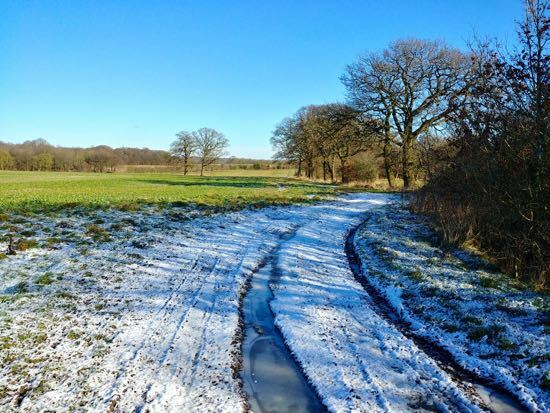 You take the restricted byway (Sandridge restricted byway 1) as it heads north and north-east alongside Hill Wood. At one point it will bend right and then left before continuing heading north-east. 20: When you reach a bridleway junction, turn right and take the bridleway (Hatfield bridleway 47) as it heads east. Continue heading east through the Symondshyde Great Wood until you reach Hammonds Lane. 21: Turn right on Hammonds Lane for a short distance looking out for a bridleway (Hatfield bridleway 41) on your left leading to Symondshyde Farm. 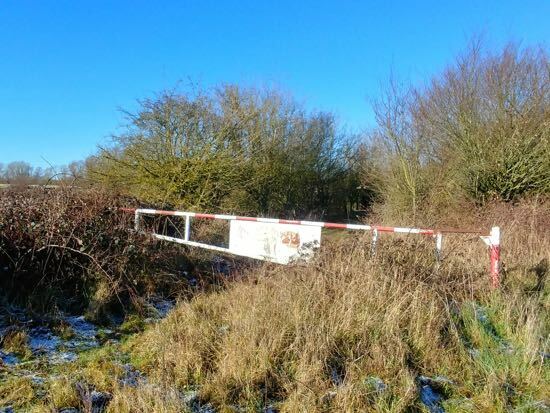 Continue round to the right of the farm and leave the bridleway by the barn and take the footpath (Hatfield footpath 50) as it heads north-east passing some rubbish dumped to the left of the path. It soon opens out into pretty countryside with good views. Continue along this bridleway heading north-east and north until you reach Cromer Hyde Lane. 22: Turn right on Cromer Hyde Lane and head north-east until you reach Marford Road. The Crooked Chimney pub will be on your right. 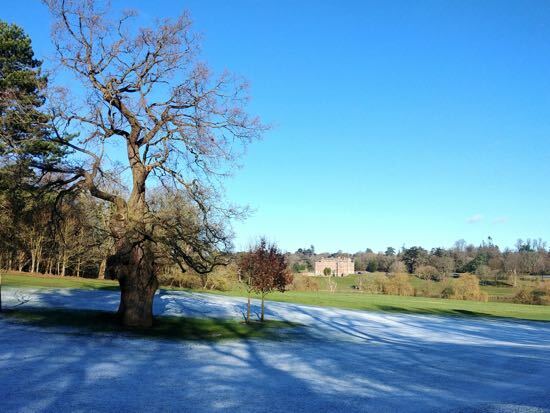 Cross Marford Road and take the footpath (Hatfield footpath 59) directly oppose into the grounds of Brocket Hall. Follow this footpath north-east across the bridge over the River Lea and up to the left. 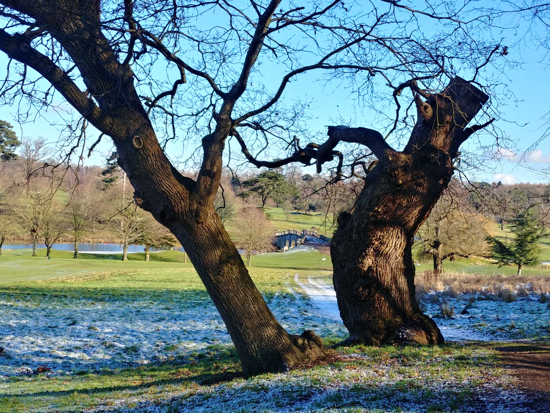 23: Climb the hill ignoring the first two footpaths on your right until you reach the gate to Brocket Hall. Turn right here and head north keeping the golf course on your right and the hedge on your left. At the point where the hedge bends to the left look out (carefully) for a path leading diagonally ahead to your right (at the point pictured below). 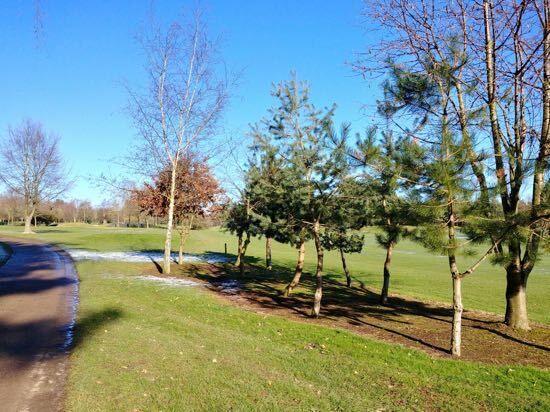 24: Take this path and head north-east across the golf course until you reach Brickwall Close. Turn left on Brickwall Close and pass The Waggoners pub and restaurant. Leaving the pub turn right and head north to Ayot Green where you turn right, cross the A1(M) and the B197, and enter the woods opposite. 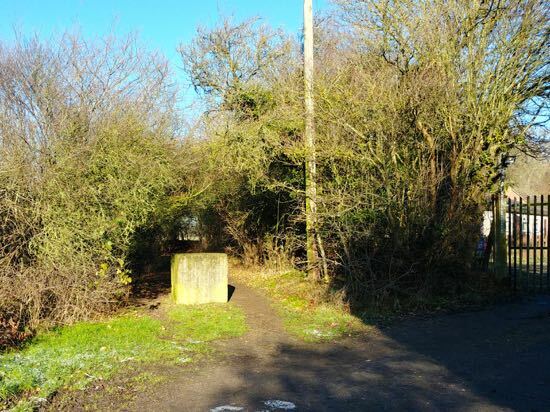 26: Look out for a footpath on your left (Welwyn Garden City footpath 34) taking you up to the old railway track. Turn right on the old railway track and follow it east until you reach the car park at Campus West. 27: Climb up to the car park and walk into Welwyn Garden City. Turn right on Parkway by John Lewis then left on Howardsgate and make your way to the train station in the Howard Centre.